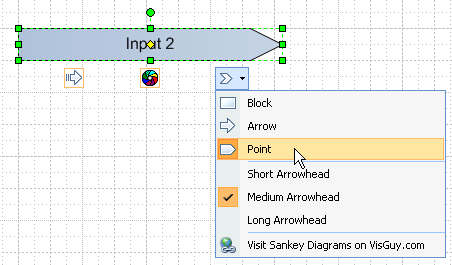 You just select the process box, and edit Shape Data properties for all five arrows in one place! It’s a bit hard to read, but it sure beats having to select all five arrows, and calculate the heights individually! You are responsible for ensuring all the percentages add up to 100, but once you’ve got it configured, the arrows will respond to changes in the height, location, and rotation of the process box. Here’s another sample. Only the second Food process needed to be manually sized. The rest of the arrows are “data driven” so to speak. The process-plus-five-arrows unit doesn’t come as a master shape, but as six separate shapes on the page. The shapes have custom ShapeSheet formulas to establish the relationships. You can preserve these formulas by selecting all six shapes and copying them together. told you you could do this without VBA. 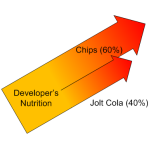 Also could orient the text based on the angle of the diagram. Width managed by control handles…can hide/show handles as needed. Connection points to chain together (type 2s). you a unit of measure. Then table/custom properties could set how many units for each given entry. Ah there’s my Sankey-heckler 🙂 Hi Ted! It’s kind of un-elegant to pre-build 10 arrows into a group, but what the heck, storage is cheap these days! Yeah, the level-text seemed like a good idea at 2am, but an in-line option might be nice. I think the Shape Data dialog is already a bit dizzying with only five arrows/10 properties, but the props could be moved back to the arrows, I suppose. If I figure out a nicer arrow that has bends in in, then maybe I’ll re-visit this. Right now, the straight-only arrows make for a somewhat boring Sankey, but I wanted to see if anyone found this interesting! Could you add arrow tails as an option? 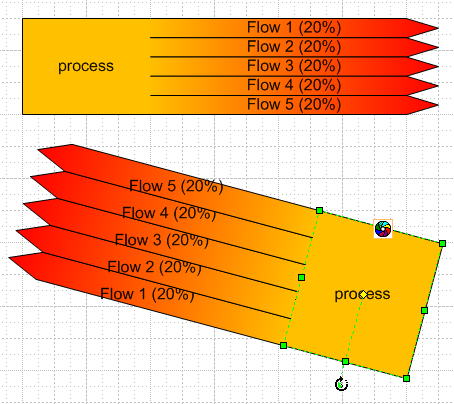 That way you could use the sankey diagram to show “inputs” as well as “outputs”. I’d try it myself, but I’m really new to Shapesheet editing. These shapes are cool to look at. However, when I print them out, I see a white line that separates the process box from the arrow. Anyway to resolve this on the print job? The white line doesn’t show on my printer (HP 2600n). I have seen these white lines even in Visio when abutting shapes that have no outline, though. Yes, we need some tail options – you mean basically an “anti-arrowhead” on the left side of the arrow shape, right?